acforbes on Lickety split labor! Cheryl Urban on Lickety split labor! On Father’s Day weekend we went on Sophia’s first camping trip with 3 other couples and their families from our small group Bible study. We only travelled an hour west of Jackson to Fort Custer State Park in the Battle Creek area, so it wasn’t too far away. It would be what Ade and I call “cushy drive-in camping”. The weather ranged from a severe thunderstorm Friday night (Sophia slept through the entire thing), to hot and humid to beautiful and breezy down by Eagle lake. All in all, it was a nice weekend except for the mosquito invasion that we encountered. We found that the mosquitos weren’t bad down by the lake with the breeze, so we spent a lot of our time down there chatting, playing in the sand and swimming in the water. We all were in charge of preparing a meal and we enjoyed s’mores around the fire on Saturday night. 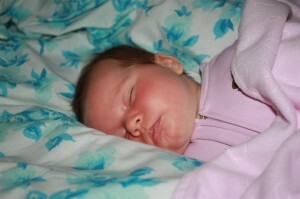 Sophia did wonderfully and slept really well in between us in the tent (nice and cozy!) in her Snuggle Nest on top of our sleeping bags. We can’t wait to take her on her next camping vacation…hopefully near one of the Great Lakes or up to the U.P. Posted in Friends by corey on July 1st, 2010 at 12:58 pm.